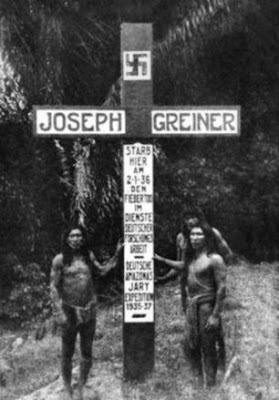 " ... Schulz Kampfhenkel, an officer in the S.S. and leader of the expedition which claimed Greiner’s life, returned from the jungles and submitted to his boss Heinrich Himmler details of the ’Guayana Project.’ ... "
A graveyard of former Nazis bent on creating a 'foreign Fatherland' in the Amazonian rainforests from which to spread Hitler's maniacal beliefs has been discovered in Brazil. The relics betray a madcap plan back in the 1930s to create a master race thousands of miles from Germany. The graveyard and other ruins that fanatical Nazis left behind are chronicled in a new book. Entitled The Guayana-Projekt: A German Adventure on the Amazon it says die-hard Nazis believed they were destined to settle the world like pioneers of the wild west in America.